Substantial drop in max heart rate? WTF? Last year during hard efforts on the bike my heart rate normally always went into the 175-185 region. This year I was only able to get my heart rate up to 175 and that was in January during a Winter training ride. Beginning of April the Tuesday nighters have started, I've been training with the fast boys since then. During those training races I have never seen my HR crack 170. 169 was the highest yesterday, even tho I had a 10' effort of 283W, which is ~110% of FTP and a 2 lap 2-man break where I was working pretty hard. I think I'm going to take a few days off the bike after today's hammer ride and see what happens. I'm slightly concerned about this, but my power output says I'm doing OK. But I'm wondering If I could do even better if my heart rate could go up a little further to deliver a few more oxygen cells for more watts? Anyone else had such an experience where from one year to the next the max heart rate dropped like 10 to 15 beats? you sure you're just not in better shape? I should be. My training regimen this year was a lot better and harder than last year. But I'm just wondering if I'm missing out on more power because my heart rate doesn't wanna go up further? however, as I get into better shape I can attempt to keep up with riders who could drop me easily, say, last season. the results are that my max HR is the same, the pain is the same, but my power is higher. hence, maybe you just aren't pushing it as hard as you could when things get really really really tough. Sounds like it may be overtraining... especially if you haven't pulled back and given yourself enough rest in that period. Yeah... I kinda have that suspicion as well. I'm going to do the Wed hammerride tonight and then two days off the bike until the weekend. Easy Sat/Sun ride on the WE and another day off on Monday. Let's see what next Tuesday brings. Resting HR was 49 this morning. Not too far off from 46 which I'm normally at. I think I'm in a similar situation Scummer. I have my CTL up to about 70 and that is high for me. My resting HR was 44 this morning after our Tuesday Night Worlds. But even after a couple easy days, it only drops to 41 instead of a more typical 38. I can get to 94% HR max when training hard but rarely go above that lately, even when maxed out. I think I need a light week. Hmm.. yeah.. at least you are experiencing the same issues I do. In a middle March to late April timeframe I raised my CTL from ~30 to 67. Maybe that was too much too fast. The last 2 weeks or so I always feel like I have a tight chest. that is a big rise. I think my CTL is over 80 right now, but it's been a very steady rise, and I don't think it was ever below 50 in winter. just checked it.. 50 to 80 over two full months, and it is showing signs of leveling off. Last edited by Grumpy McTrumpy; 05-05-10 at 09:44 AM. Ok, but so what? You have a powermeter, use those numbers. Max HR is not the right benchmark to use for HR training anyway; instead for HR work you should use a threshold HR. quick question, for what is CTL an abbreviation? also, if my legs feel a bit sore two days after a hard work out when normally it's sore for one day, should i cut out all the intensity training (2x a week) or just cut it to once for that week? or is it recommended that i should not at all? So lower max and avg hr = in better shape? Not running power but I observed the similar max heart rate drop as the OP. Heart rate in January after a layoff was hitting as high as 190 (highest I ever hit on a bike) when I struggled on fast paced group rides. Now I am not seeing anything beyond 178 but it feels like I am redlining when I get above 172. BTW, I do not think I am overtraining atm. I would think so, assuming the power is the same or better. In my first races, I was averaging 185 bpm the whole time, e.g. hurting (196-ish max). Now I do the same or longer races and average 175 or lower, and power is up. I'd start worrying when power goes down, and maybe max HR, but not avg HR. I think I need to raise my FTP by a bit. drink some coffee before a ride and see what happens. What he said.. And you cant compare HR to watts. Here is how I view it. A strong measure of fitness is avg heat rate to power. 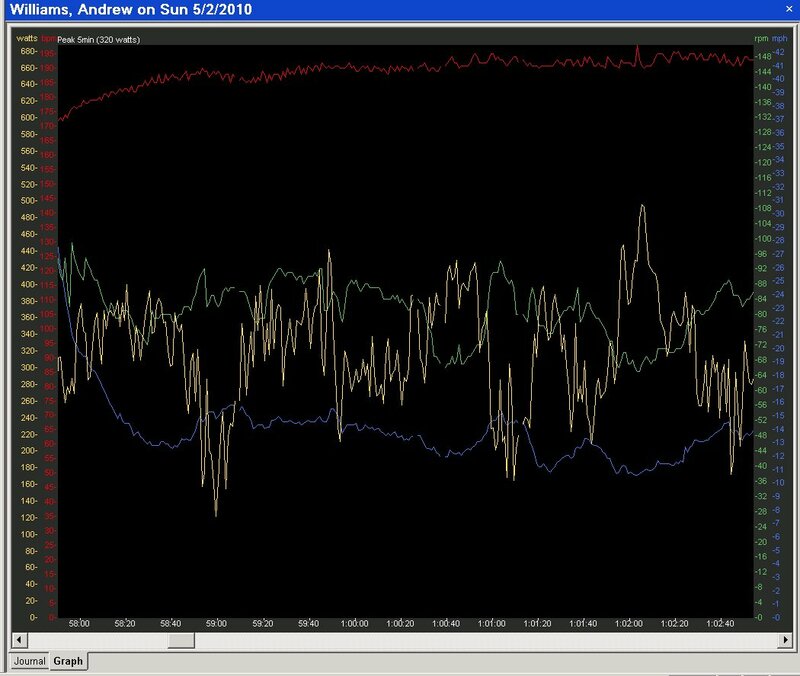 For example, if you start the season at 160 avg hr at 240 watts, then later in the season can do the same 240 watts at 150 hr, you are in better shape (we are talking not just one ride but normalcy as HR can change day to day from sleep, stress, food, etc.) So avg hr can be used to indicate fitness in at least in this regard IMO. I still think you would hit your previous max HR if you really went deep into the red. these days I don't hit it except on all-out uphill efforts that last 5 minutes or so. Grumpy, that's the whole point, you don't hit it and you think you should have. Normally I get 96-98% mhr when burying it on a climb. When over trained, everything kind of dies at 92-94% mhr. I'm not talking 100% mhr, that hurts too much. if you were truly overtrained then you would not need HR to let you know. getting dropped on the hill would be all the info necessary. or maybe just not seeing the kind of 5 minute power you expected. 5 min. hills are non existent in IL and IN. I know. I was born there. have you gone DEEP into VO2max for 5 minutes lately? this was a seriously painful effort that resulted in holding on to the pack on a brutal climb and giving me a new 5m w/kg record.